North Korea has a rich culinary heritage shared with the South. Dishes originating during ancient Korea remain heavily influential to modern cuisine in both preparation and presentation. You can count on a diet heavy on rice, vegetables and meats, it’s not just kimchi! Pyongyang may be way off becoming the ‘foodie capital of the world’, but there’s a wide array of tasty (and familiar) ways to please your taste buds on your tour. Here are five of our absolute favorite foods in Pyongyang! Naengmyeon is an iconic noodle dish you’ll find in every major Pyongyang restaurant. Handmade buckwheat noodles are served cold in a flavored broth of either beef, pork or chicken before being topped with kimchi, cucumber, slices of meat or pickled radish, and egg. It’s then spiced up to your liking with condiments such as red chili paste, vinegar and soy. The noodles are not cut and they have a smooth texture, which can prove a challenge to eat without some serious chopstick skills! Your Korean guides will eat this famous dish at every opportunity. 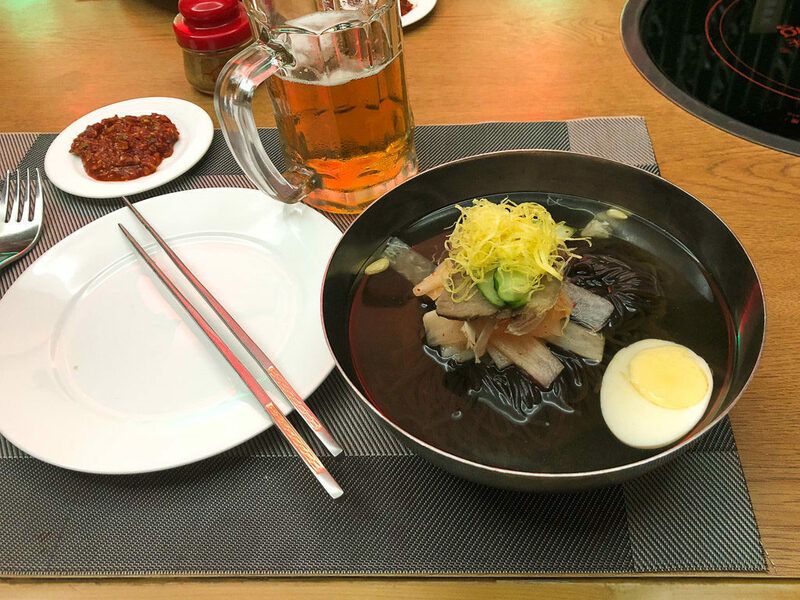 If you haven’t tried Naengmyeon, you haven’t been to Pyongyang! Dolsot in Korean means ‘stone pot’ and bibimbap literally translates to ‘mixed rice’. It’s a simple yet classic example of Korean cuisine where white rice is topped by assorted vegetables, meats, and fried egg, which are then seasoned. The dish arrives at the table still cooking, sizzling away and ready to garnish with red bean paste and soy. Soup is then added to the stone pot and it’s stirred thoroughly before eating. Dolsot bibimbap is easily altered into a vegetarian option. 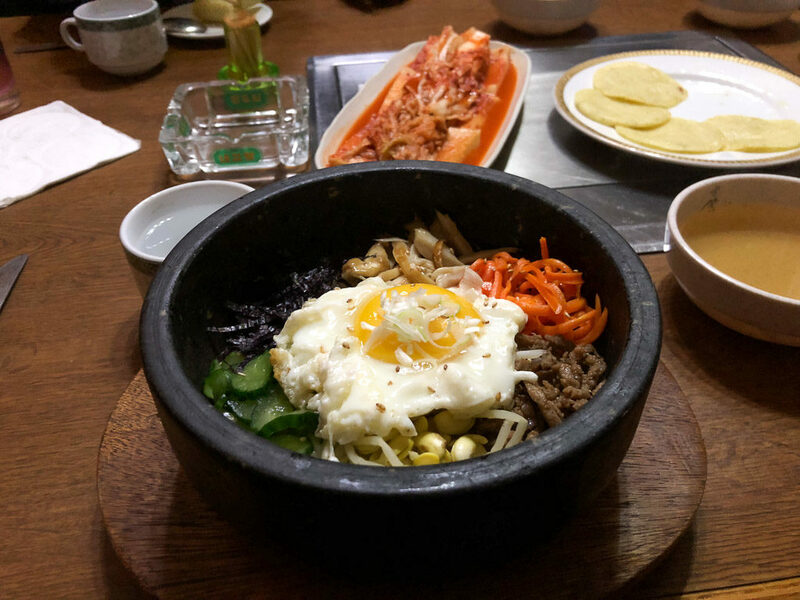 Be sure to also ask your Korean guides to share the fable of how bibimbap originated! 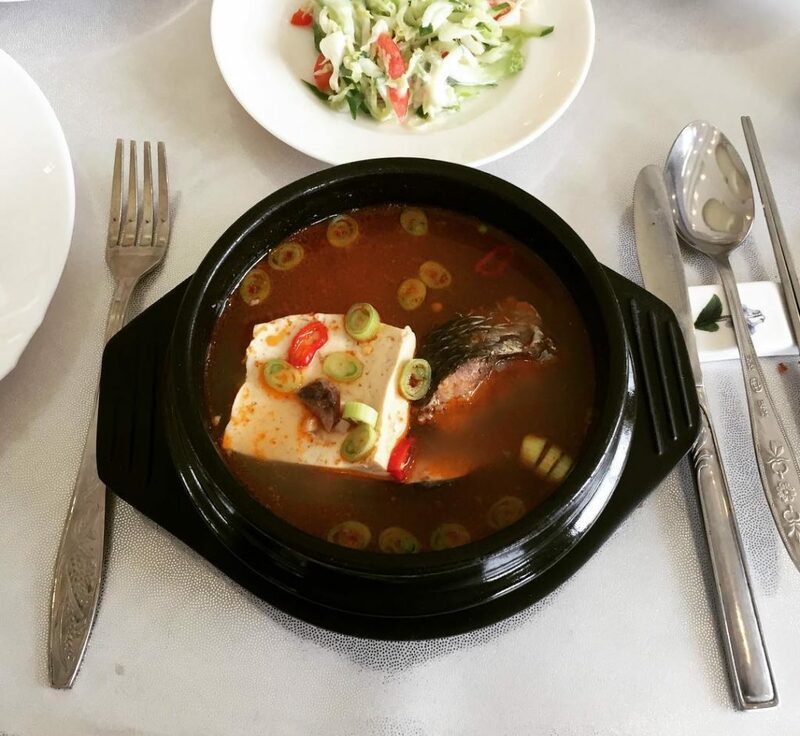 For all you seafood lovers, Grey Mullet Soup of the River Taedong is considered to be the most special, hearty seafood meal in Pyongyang and is traditionally served to honorable guests. Since ancient times, the grey mullet native to the Taedong River has been renowned for its flavor and high nutritional value. The grey mullet is firstly cleaned but not skinned, then cut into small pieces to be salted and boiled with black pepper. Red bean paste, peppers, soy, garlic and even tofu are then added to the clear broth before serving. We see this as an entry level North Korean seafood dish in comparison to the petrol clam bake and sashimi (raw fish) found on the east and west coast! 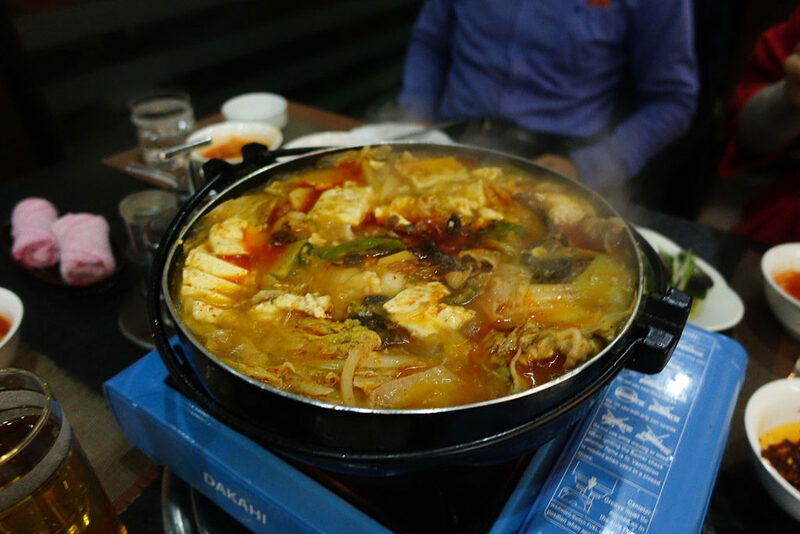 Jongol is a Korean-style hotpot, a self-serve stew cooked at the table which is filled with assorted vegetables, tofu, egg, clear noodles and most famously in Pyongyang it is prepared with marinated sliced beef. The broth is seasoned with garlic, salt, soy and often red chili paste to give it a spicy kick. The order in which you put on the ingredients will change the taste to your preference. There are a number of specialty restaurants with great atmosphere in Pyongyang serving jongol, it’s always a lot of fun! Korean BBQ is a popular style of restaurant where you’ll be able to personally grill your own array of meats right there at the table with a built in gas or charcoal grill. It’s a hands-on affair — you’ll have beef, pork and chicken at your disposal and a plethora of other Korean side-dishes extending to the width of the table. A waitress will help attend to the meats, so it’s not all work and no play. 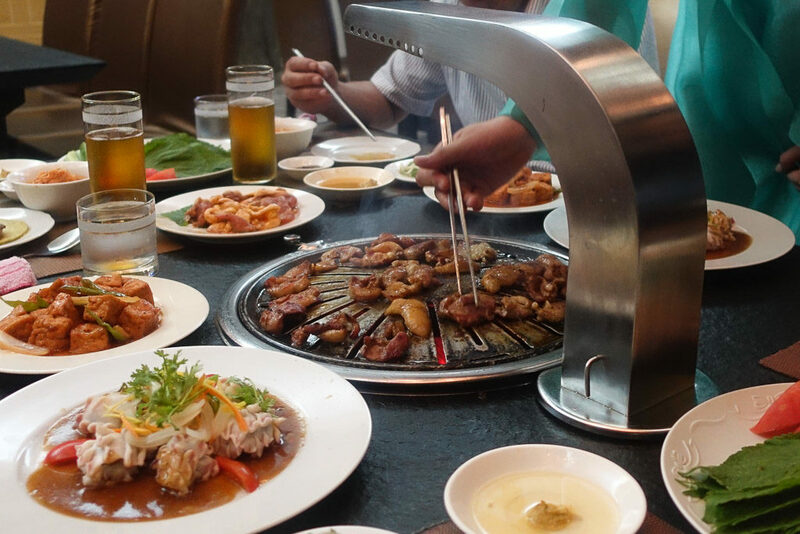 It’s a large-format meal and the meats aren’t all cooked at once, making Korean BBQ best enjoyed with a group of friends on a night out over some ice cold Taedonggang beers! For most people visiting the DPRK, the experience begins when they board the Air Koryo flight to Pyongyang. 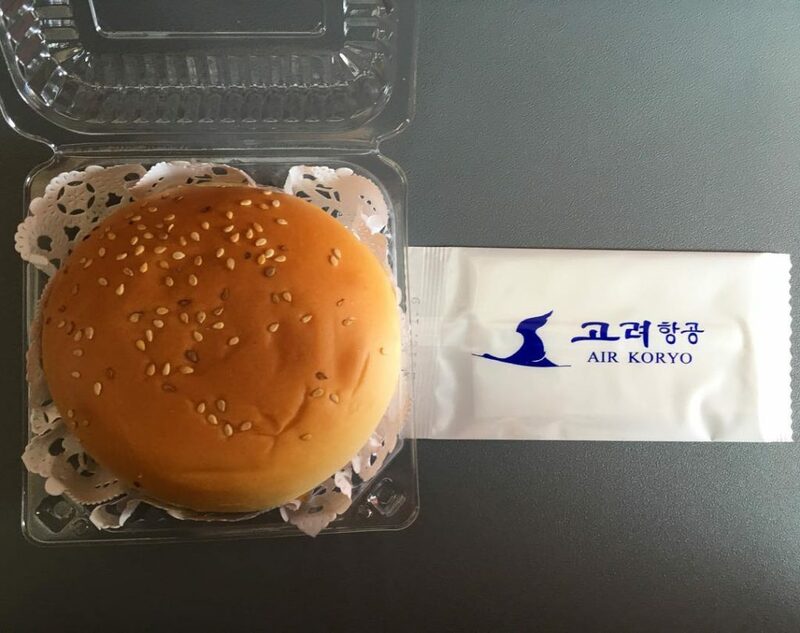 That experience is often defined by the in-flight meal, an intriguing ‘Koryo Burger’ served cold containing a mystery meat and processed cheese between stale pieces of bun. It’s generated somewhat of a cult following over recent years and opinions vary as to what the meat actually is. In the past there has been a number of variations of the ‘Koryo Burger’ — one that was arguably chicken or duck and another vegetarian option that was simply the same burger minus the meat, leaving just lettuce and tomato. So, is the ‘Koryo Burger’ actually any good? Taste-test verdicts has varied between ‘decent’ to ‘not as bad as expected’ to ‘disgusting’, so we’ll let you be the judge! A massive range of diets can be accommodated on any tour to the DPRK. This includes vegan diets. If you have any specific dietary request, there is every chance it will be possible, email us and we can advise!